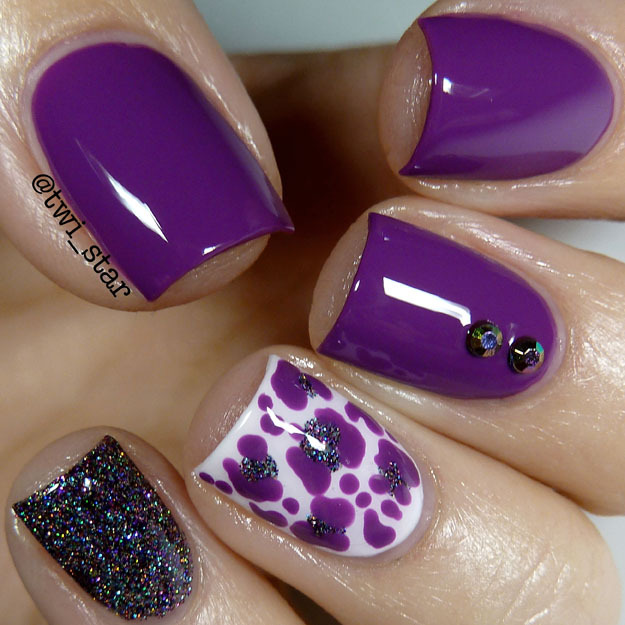 Today’s mani is a Bestie Twin Nails with the adorable Falguni, from Topic Girl and @falguni_nails on Instagram! She asked if I wanted to do a twin mani and I agreed immediately because I just love her style! She posts the cutest outfits and manis! 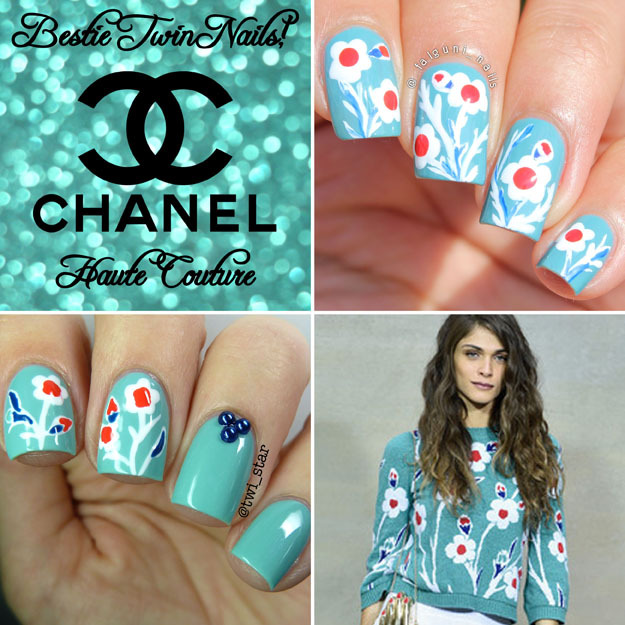 We both love all things Chanel and we agreed on using the below image from Chanel Haute Couture Runway 2015 because the pattern is just so sweet and springy on the sweater! 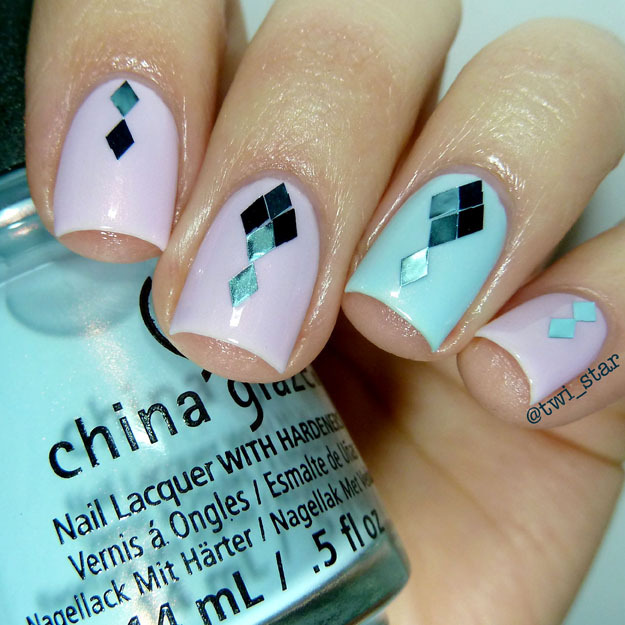 This color combo is so fab! The poppy color plays so nicely with the seafoam. 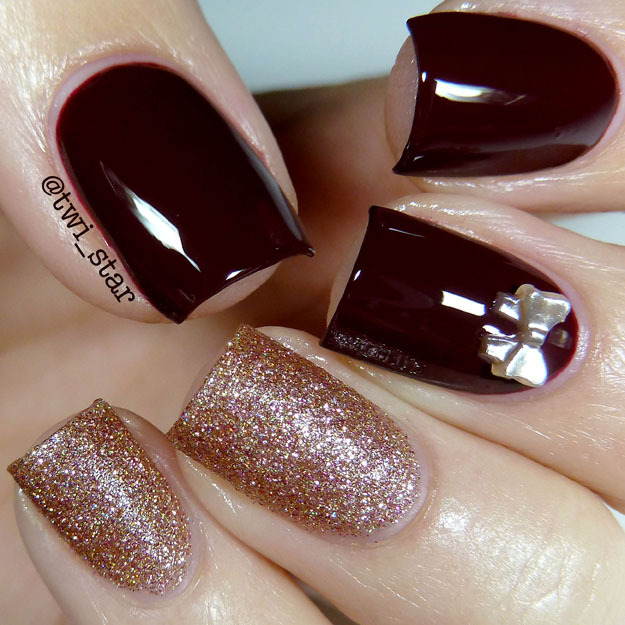 Here are our Bestie Twin Nails! 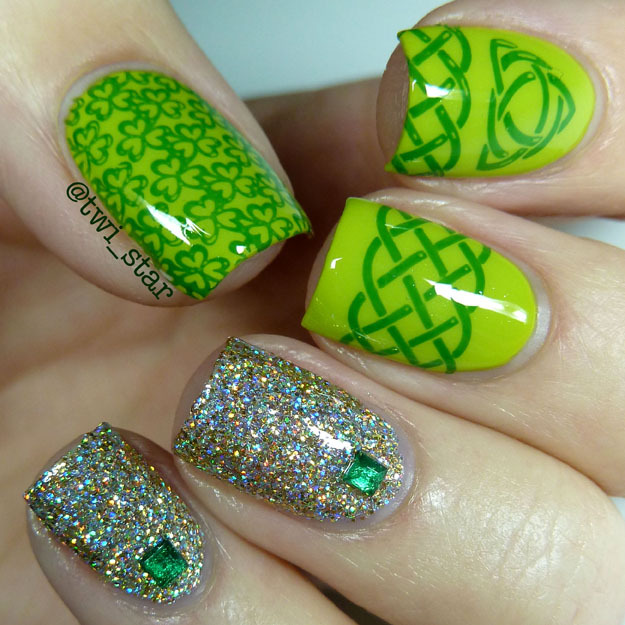 We thought it would be fun to not do the same exact mani but instead show our individual styles a little. 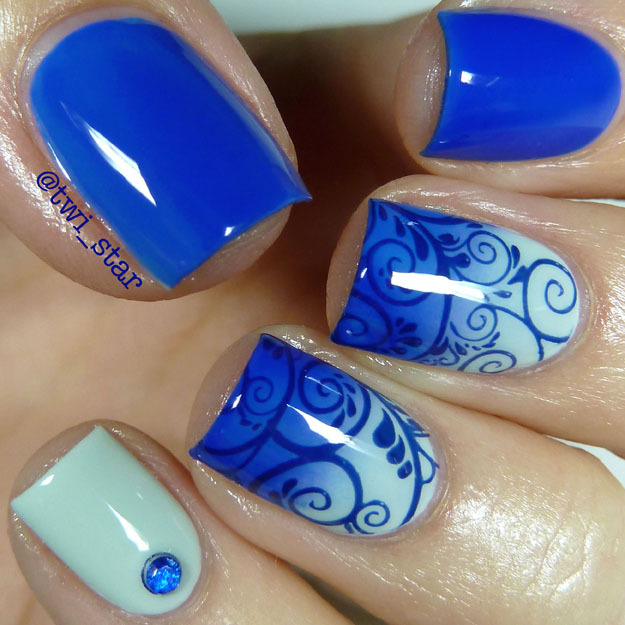 Falguni did so great at recreated the pattern on all her nails, she has such a lovely painterly style. Since I’m not that great at freehand haha! I cheated and only attempted the pattern on 3 nails (see my thumb below) and added a few pearl studs because I just can’t seem to do a mani without studs. 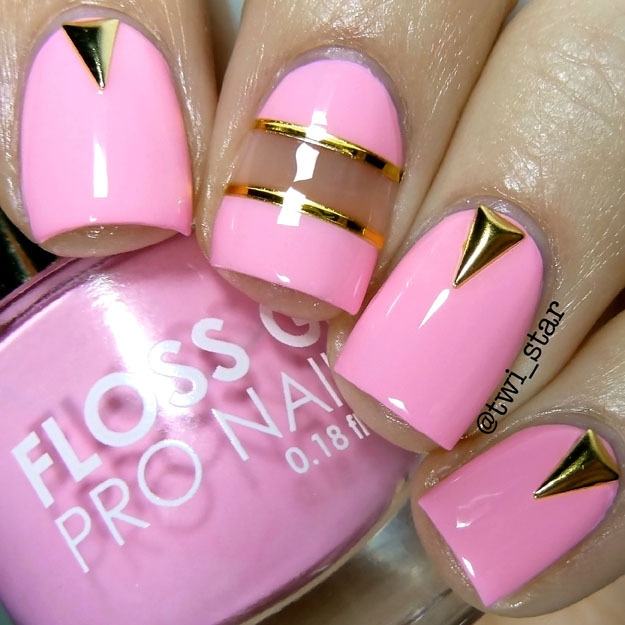 Today I am reviewing some triangle nail studs from Born Pretty Store! 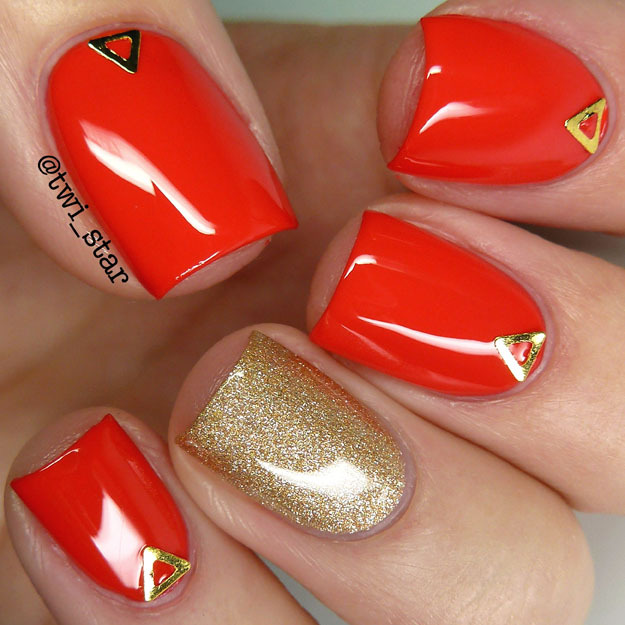 Isoceles Triangle Gold Nail Studs Item #16679. 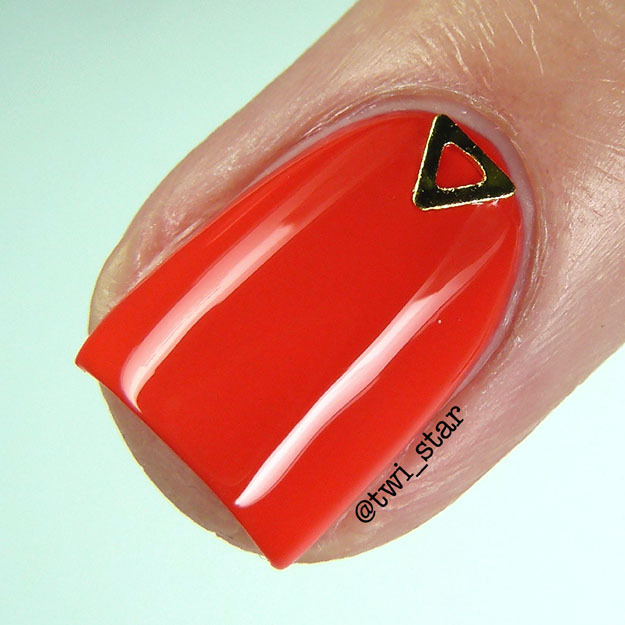 I have been loving triangle studs lately, they just look so edgy or something lol They were perfect to pair with China Glaze Road Trip polish I Brake for Colour. Check out what I came up with! 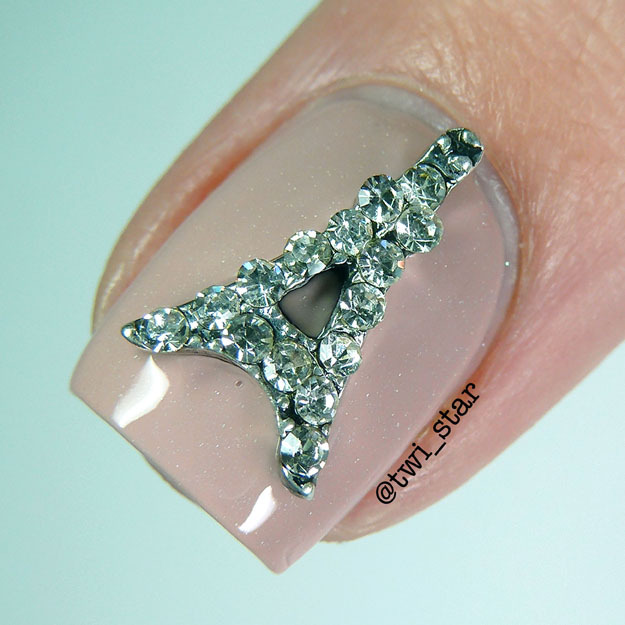 Today I have a really cute Eifel Tower nail charm Item #16963 (color SH552) to review from Born Pretty Store! In case you haven’t noticed, I love nail charms hahaha It’s a little bigger and my nails are a little shorter at the moment so I place it on my thumb nail, check out my mani! 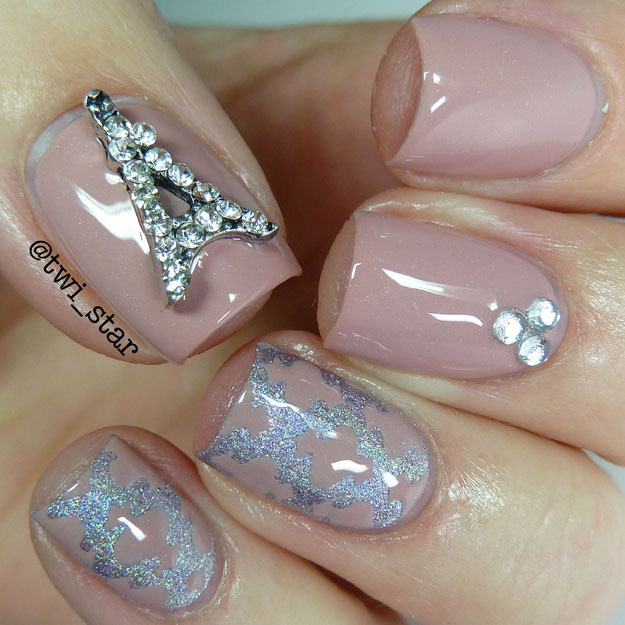 The Eifel Tower Nail Charm is all blinged out and fancy, it is so cute! I just adore it. 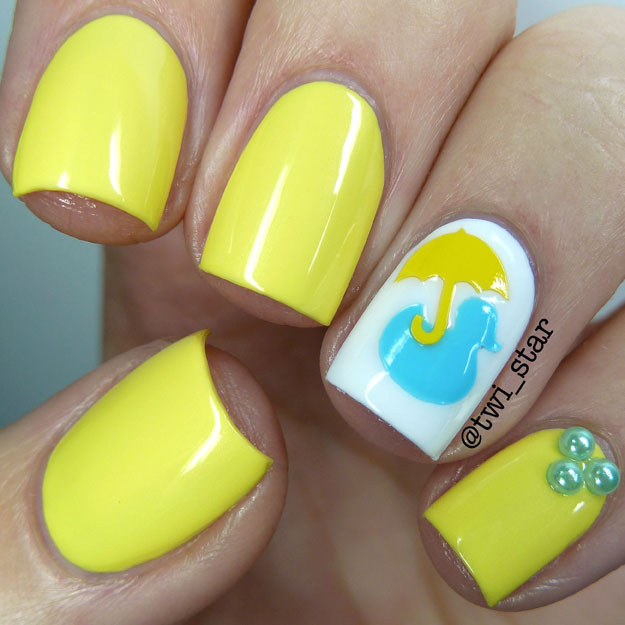 It is slightly curved so it has more surface area to stick to your nail. Since I have a pretty strong C-curve to my nails I always appreciate charms that aren’t flat as they stick better. I just slapped this one on after a nice coat of top coat and so far it’s staying on perfectly! 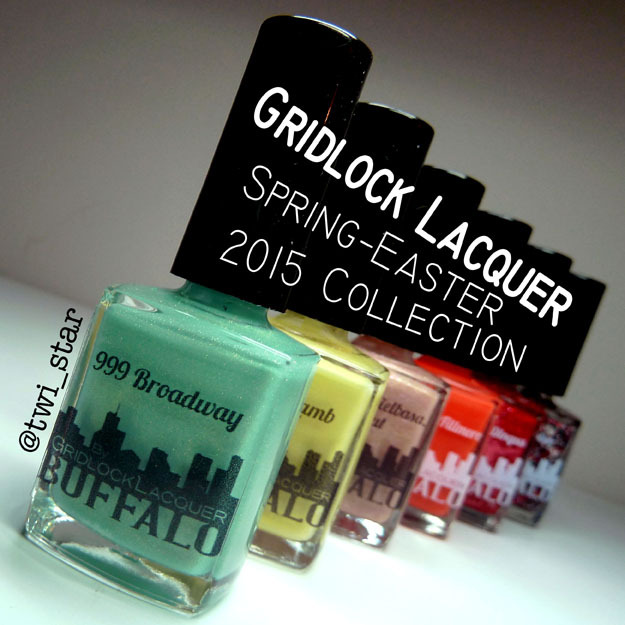 Gridlock Lacquer Spring Easter 2015 Collection swatches! 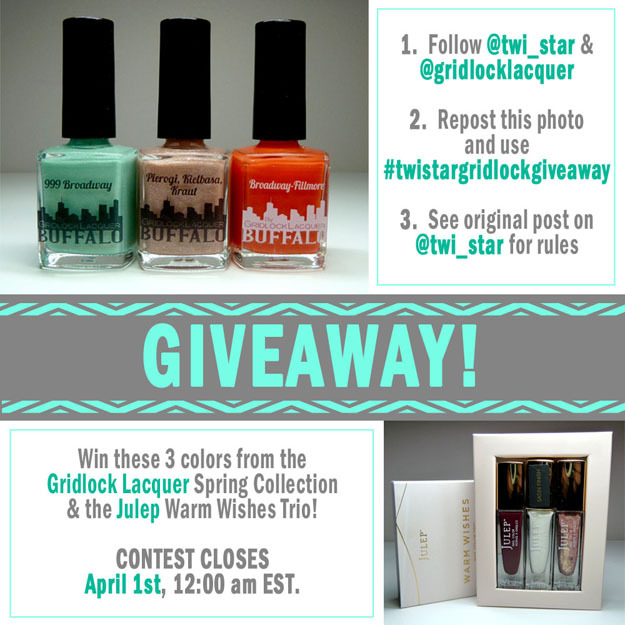 Today I’m going to share with you the Gridlock Lacquer Spring / Easter 2015 Collection! I was super excited when I got these in the mail for review because a bunch of the polishes were inspired by Polish traditions……… yea not polish as in nail color but Poland! Lol My family is Polish so these were right up my alley. Shall we get started? 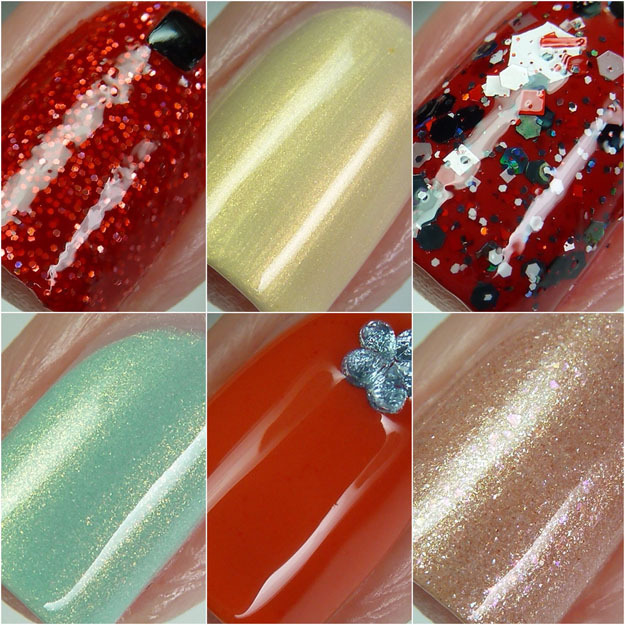 There’s a little something for everybody in this collection, glitter, pearl, crelly, and shimmer! On to swatches. Today I will be reviewing a product sent to me from Born Pretty Store, 2x4mm Rhombus Glitter Item #16757. I chose the light blue color to review but it’s listed as 804. I’ve never used loose nail art glitter before so I was excited and nervous lol I decided to pair it with 2 colors from the China Glaze Road Trip Collection, Wanderlust and Dashboard Dreamer. If you follow me on Instagram you probably think I’m sounding like a broken record because I won’t shut-up about the collection! I can’t help it, all the colors are just so “me.” Onto the mani! The glitter comes in a mini clear jar, as you can see this is like a lifetime supply lol They are super shiny and reflective, I stared at this little jar for entirely too long…… must…… have……. Shiny things! Last night when it came time to do my Monday mani, I was feeling a little uninspired, so I went with my go-to look. It consists of using a couple of cremes, a leopard accent nail, a glitter accent nail, and then throwing on a couple of jewels or studs. Boom, donezo. 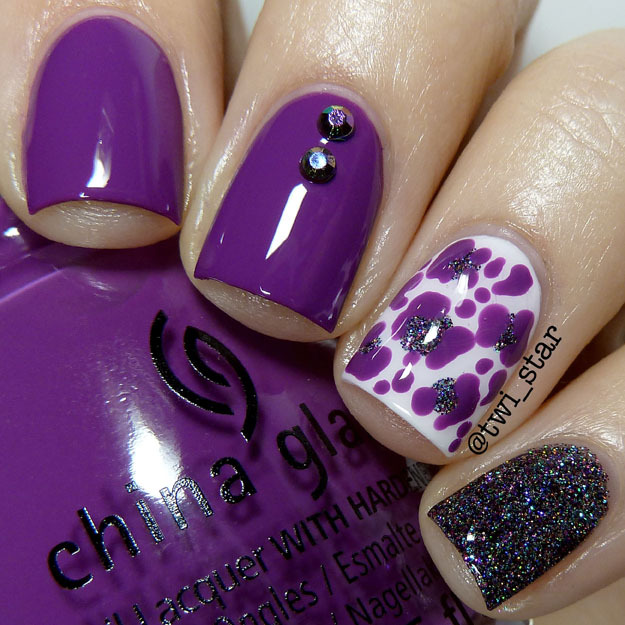 This time I was to use a couple of the China Glaze The Giver colors. 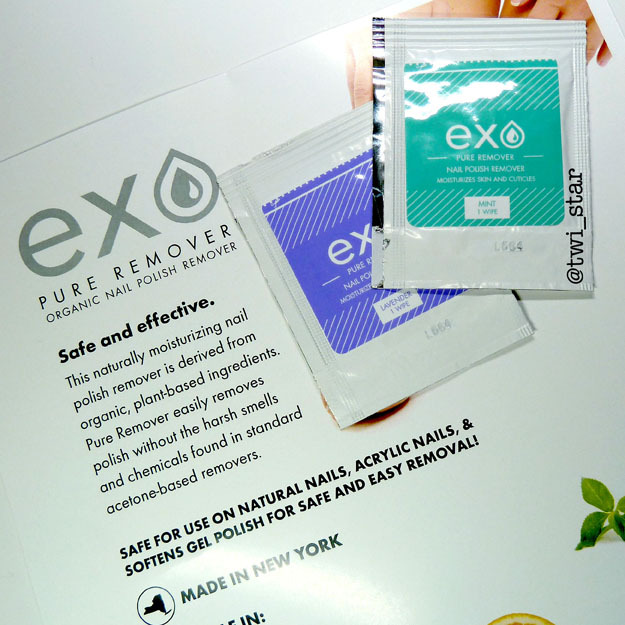 EXO Supply PureRemover Organic Nail Polish Remover Review! Today I have something a little different to share, different is good right? 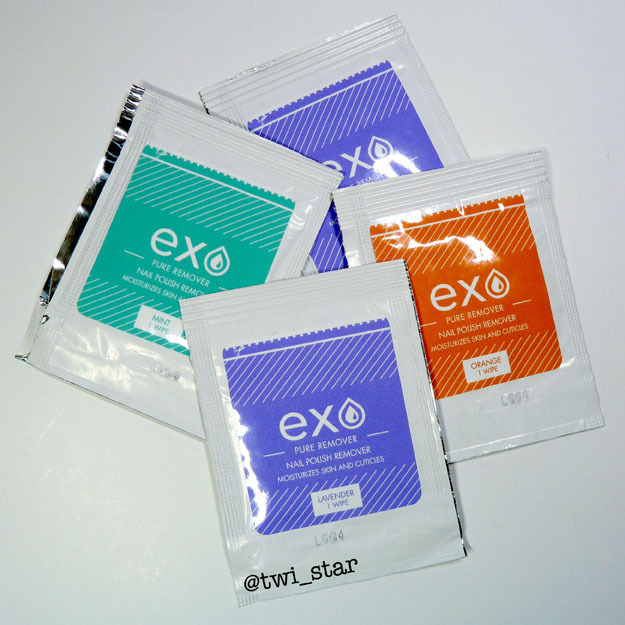 I was sent samples of an organic (you read that right) nail polish remover from EXO Supply, PureRemover. I received their PureRemover Wipes but it also is sold in traditional style bottles as well. EXO Supply is located in my neck of the woods here in Buffalo, NY! I love it! I love my city and love supporting our local companies, but honestly this company is becoming more than local, their products were recently included in the celebrity swag bags given out at The Grammy’s! Don’t believe me? Check out EXOSupply Instagram to see some pics of the Brand’s Founder Elyse with some celebrities that were there. Ok onto pics and some info about the product. PureRemover™ is a naturally moisturizing nail polish remover derived from plant-based, organic ingredients; designed to condition and repair your nails while it removes polish! Available in several natural scent, this nail polish remover is safe for use on natural nails, acrylic nails, and even removes most gel polish! Skip the stinky acetone and pamper your nails with Pure Remover. Naturally Moisturizing - Infused with USDA certified organic essential oils. Made with plant-based ingredients - We choose only clean, eco-friendly ingredients to make our products..
Biodegradable esters, USDA certified organic essential oils. Here are the sample PureRemover Wipes I received in scents lavender, mint, and orange, they also come in unscented. These would be perfect for traveling or on the go, and the color coding makes it easy to grab the right scent that you want to use. The PureRemover Wipes sell 10 for $12, 20 for $24 and 30 for $30. Want to read more of my review? Click below! Last week I received my Creative Shop Stamper that I ordered from Bsquared Lacquer so I needed to give it a try as it gets such rave reviews. Spoiler alert! I really really like it, and I thought it would be a good time to use 2 of my un-trieds Azature Lapis Diamond and FlossGloss Moon Baby and do some sponge gradients. 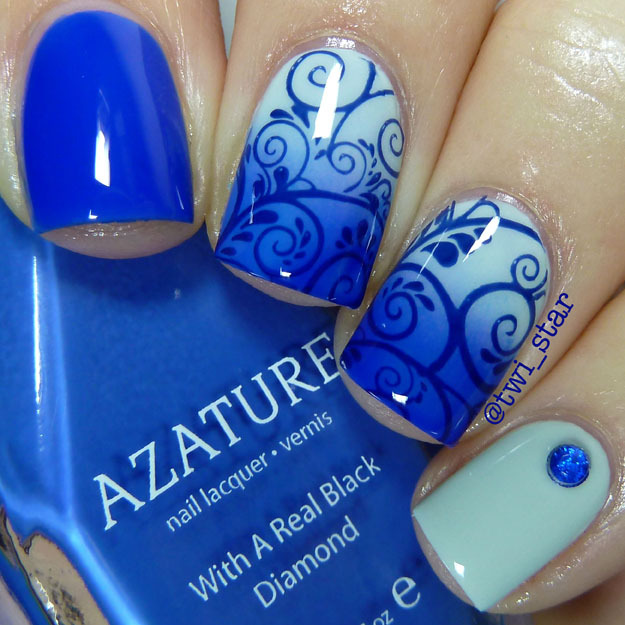 Check out my mani using the stamper. First let’s talk about Azature Lapis Diamond. I was super excited about this one since lighter blue cremes are my thing, in the bottle it’s a deeper almost periwinkle. It applied very nicely but even after the first coat I knew something was weird about because it started to changed colors, and not like an all over solid change but streaking in places and turning darker. And then once I added top coat it darkened even more, but at least it ended up being a little more even but as you can see it looks nothing like the bottle. Maybe a different top coat would help. You can see it the most on the thumb. I’ve had other similar colors react like this so I think it is something with the pigments used, I’m looking at you Julep Taylor! It's still Winter and I've been doing bright manis so I went with something "season appropriate" whatever that means. 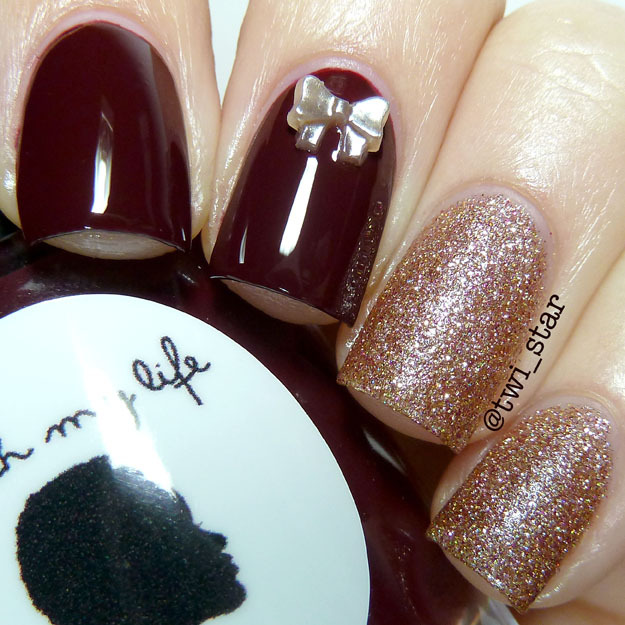 *eye roll* Polish My Life Pom Pom Spice, a deep vampy burgundy creme seemed perfect and here it is! Pom Pom Spice is one of those vampy colors that's not quite red or brown it just is. First coat was kind of crappy but the second coat went on great and covered to full opacity. Want to see more amazing pics?! Click below! The first color that caught my eye from the OPI Hawaii Collection at ULTA was This Color's Making Waves, in the bottle it,s a shimmery deep blue green with very fine orange/gold shimmer. 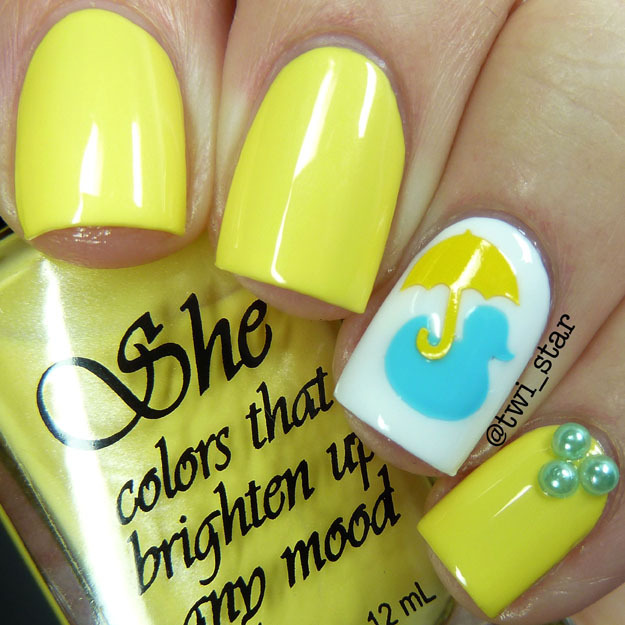 I figured it wouldn't really look like that on the nail, but to my surprise it looks like that..... but BETTER! Holy crap people, this polish is amazing. Check it out! They say in like a lion out like a lamb and I have never hoped for this to be true more than this year! I’ve had enough cold and snow this winter to last me a lifetime, arrrggghhhhh! 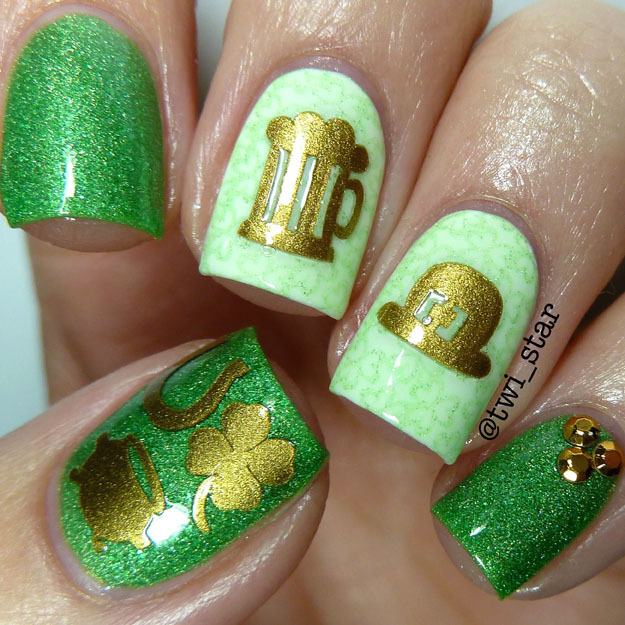 At least I can cheer myself up with some St. Patrick’s Day nail art. 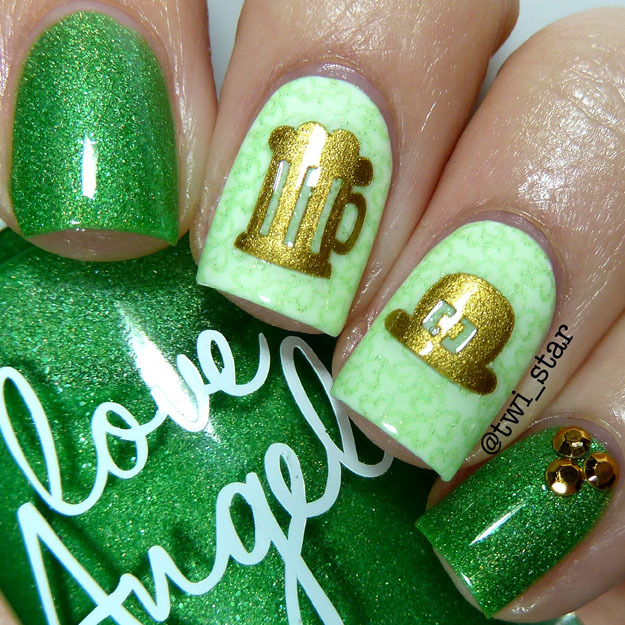 I busted out some gold nail vinyls that were sent to me for review from Vinyl It Up. Check out what I came up with. 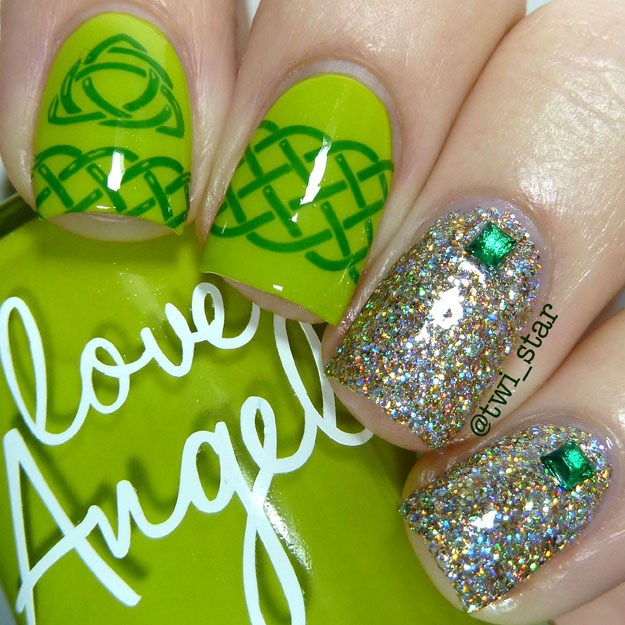 This subtle holo grass green is from Love Angeline. 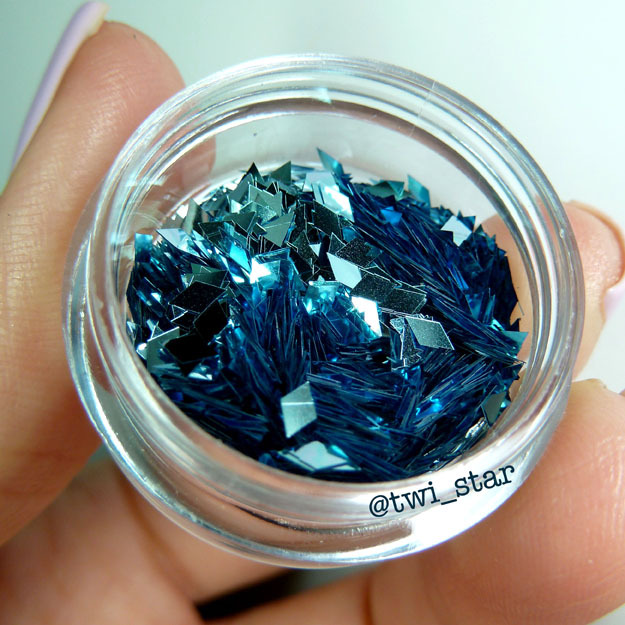 I don’t know this colors name because I received it in a mystery grab bag, so it was unlabeled. But anyways, it does have a very nice formula and covered perfectly in 2 easy coats.